Driving in Ireland is definitely an adventure. According to Google Maps, our route above only takes about 13 hours if you drive it straight, so it’s not a bad drive if you only have a short amount of time. The rental car is the best part—the steering wheel is on the right side, and you have to drive on the left side of the road. WHAT?! It gets better! We chose a manual car (to save money) and even though Jorge is a pro at stick shift, it’s very different to shift with your left hand when you’re used to shifting with your right. The car had stickers reminding you to “keep left”, but trust me that’s easy to forget. Every other block seemed to have a roundabout, and that day we learned what a roundabout was, haha! We kept driving around the circle multiple times before we figured out our exit. After a few miles of driving, Jorge started panicking and pulled into an Ikea parking lot saying, “I can’t do this! Pray for me I can’t do this!” I laughed a little but was able to calm him down enough to keep going. By the end of the trip, he was driving like a local. Regardless of how difficult it seems at first, I HIGHLY recommend driving through this country. It adds to your overall experience. You get to see some of the cutest towns as you drive to your next destination, and you can stop whenever you want to get a picture of that castle. I foolishly thought there’d be a highway from one place to another, but at some point, after Dublin, you have to drive through small towns in order to get across—there are no major roads. The towns aren’t flat, the roads aren’t wide, and the signs are confusing. On our way to Galway we came across a road called “Corkscrew Hill”, and it was as crazy as it sounds, so be prepared for a few challenging areas. Definitely, invest in a GPS when you’re driving in any foreign country! Jorge wanted to opt out of it saying we can use maps?! Uh, no. Pinterest was barely getting popular when we went to Ireland, and I remember there was one specific pin/photo in Cobh I had to find (don’t ask me why). We took the long route from Dublin to Killarney to find this little town. I’ll never forget Cobh. Comparable to San Francisco, it was one of the hilliest places we’ve ever driven in. We nervously drove around and couldn’t find this specific photo spot so we decided to park and just walk. Jorge found parking on a street with a steep incline, but as he was trying to get into the tight spot the car started rolling forward! I just about died when Jorge pulled the brake and the car stopped an inch away from hitting the car in front of it. I then searched the nearby area for my “Pinterest in real life” spot and quickly gave up. Just too shaken up to care anymore. Later on, we realized that the pin was only a block over! We just laughed it off and said “never again”, though we’ve done similar things many times after that trip. How can you go to Ireland and not stay in a castle? We spent one night at the Ballyseede Castle in Tralee on our way to Dingle. The castle has been around since 1590 and since then has been transformed into a hotel. We had a great stay, I felt like a queen for a day! We were greeted by the castle dogs, Arthur and Einstein. Our room was small but lovely. The sitting rooms around the castle were gorgeous. The breakfast room was so fancy, it made me feel incredibly underdressed. We really enjoyed our little moment of relaxation, walking around the property, watching Arthur play with the Irish donkeys on the front lawn. I’d definitely do a castle stay again. Dublin is one of my favorite cities. It’s gray, it drizzles, and it always seems to be 50 degrees, but my goodness what a beautiful city! Dublin is where we first tried Bewley’s Cafe. Remember, at this point, we had already been to Italy and had the best coffee ever, but I can honestly say that Bewley’s was up there too. They roast their own coffee so it’s as fresh as can be. I am not ashamed to admit that we went back every single day! We did try other coffee places around Ireland, but Bewley’s should definitely be on your list. You can find Bewley’s Cafe located on Grafton Street in the center of Dublin. They actually have an online store too, so during the Christmas season we like to get coffee bags shipped to us for a little holiday treat! When the sun goes down, the temple bar area is the place to be! Each window we walked by had musicians performing either traditional Irish music or modern American music. 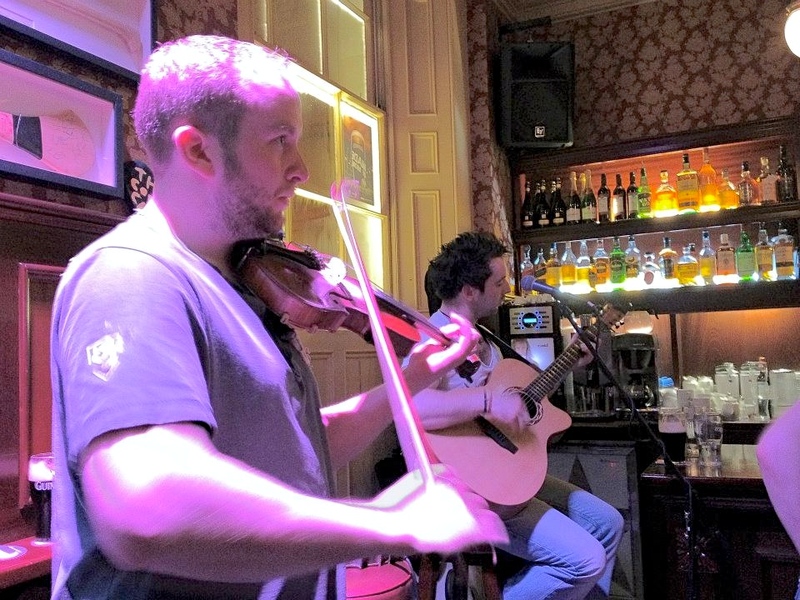 When we go to another country we like to immerse ourselves in it, so we chose a bar playing traditional Irish music. On our way to Killarney, we made a quick stop at their national park. I always love mixing in nature after I’ve spent a few days in a big city. It’s a HUGE park, and we only got to see a small part of it, but it was a great way to stretch our legs after all that driving. We came across a waterfall, took a short hike, then made our way to Killarney. Killarney is a quaint, colorful town filled with some of the nicest people. Have I mentioned how nice the people in Ireland are? We experienced above & beyond service in many restaurants, hotels, and bed & breakfasts from every town we visited. Plus, they have the best accents so they’re already winning. The Cliffs of Moher are one of the most visited natural attractions in Ireland. If you’re into breathtaking views of the Atlantic Ocean then it may be worth a trip. Unfortunately, since I didn’t have a real camera at this point I couldn’t really capture the beauty that is this view (shame on me, I know). 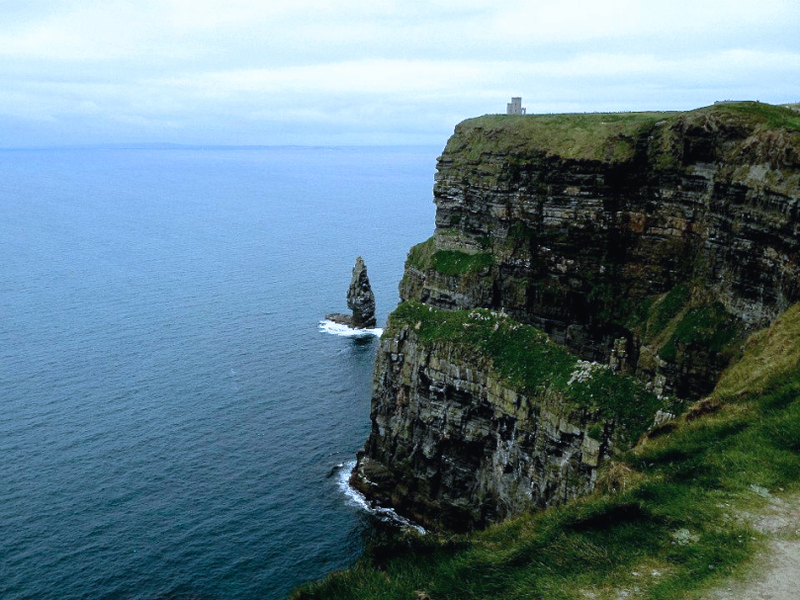 The cliffs are 5 miles long, over 700 ft tall, and O’Brien’s Tower stands at the highest point. Be prepared for some very strong winds, and make sure you have a camera ready for an entertaining photo session! Dingle has my heart. If you’re visiting Ireland, you have to go to Dingle and drive the peninsula along the ocean. It’s the tiniest little postcard town located on the very tip of Ireland, but we both agreed it was our favorite. I loved it so much that it has to have its own post. Stay tuned for the reasons why Dingle is so awesome. *Note: I didn’t get a new camera for travel until 2015, so I have 4 years of trips captured with whatever iPhone I had at the moment. Forgive the quality of some, but I promise they get better!